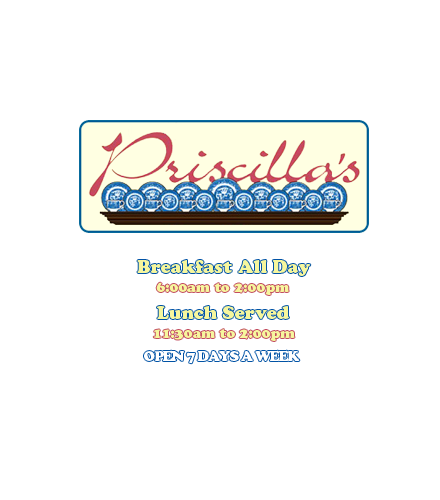 Priscilla’s Restaurant – We opened our eatery on May 23rd 0f 2009 naming it Priscilla’s in honor of Carol’s mother, Priscilla “Pat” Antone. Our menu is steeped with family tradition thanks to the generations-old recipes and influences passed on by Pat and other family members from both sides. We wanted to open a family-friendly, comfortable spot where people could come and enjoy the beautiful views of Mount Washington and the surrounding peaks while enjoying a great meal at a great value…We’ve Done It! So whether you are here to enjoy the breathtaking area and surrounding Mount Washington Valley, or you consider yourself a local, please do stop in and try something classic, or one of our delicious family inspired recipes.